AP Teachers Transfers,Rationalisation 2017 U-DISE 2016-17 School wise Strength Enrollment Particulars 2017 #AP Teachers Transfers Rationalisation 2017 U-DISE School wise enrollment details academic year 2016-17 School Roll Enrollment Particulars as per U DISE 2016-17 released by CSE AP. 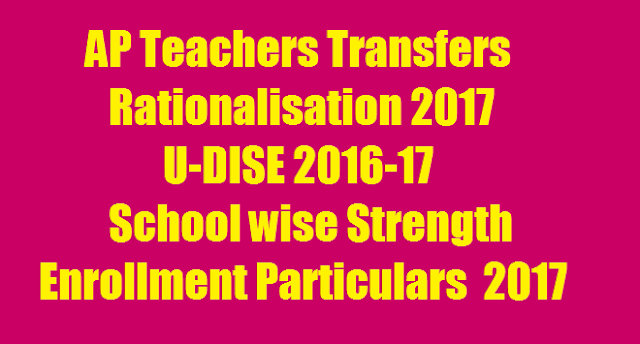 Teachers who want apply online web counseling for teachers transfers Web Counselling 2017 know put web options once check child ratio - Teachers ratio in rationalization 2017. AP schools like Primary upper primary high schools enrollment 2017. Web counseling options depend on child ratio if you do not check child enrollment particulars your post must put in rationalization next the academic year 2017.